The poor foodie has come under attack lately. Not too long ago, B.R. Myers gave them a whomp in The Atlantic for their callous obsession with food fads and gluttony. Just this past week, I read an article in Slate by L.V. 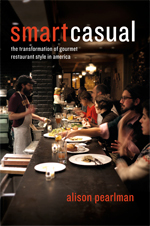 Anderson that reviewed a new book on the shelves (Smart Casual: The Transformation of Gourmet Restaurant Style in America, by Alison Pearlman). According to the latest, being a foodie is to have a false sense of moral entitlement and social responsibility. The first time I heard someone use “foodie,” I remember thinking: Oh, how cute! Here I thought it was a word for those of us who take a keen interest in food—someone who enjoys the adventure and camaraderie of trying new things with those who share a similar passion. Granted, I’ve also heard it used as a more derogatory synonym for “food snob” (and I think the Urban Dictionary definition puts it even more eloquently). But little did I know we had a serious societal problem on our hands. I liked Anderson’s comparison between the foodie and its cultural cousin, the hipster. It’s hard to define either one in anything but abstract terms. People struggle to provide an operational definition for a hipster, yet they “know the type.” Up until I read Anderson’s article, I never thought of either as having a negative connotation. Little did I know they were societal nuisances—hipsters for their political apathy and foodies for an air of moral superiority. What this whole thing really is: a slightly scathing critique on the restaurant industry and current practices. As the symbol of it all, they’ve chosen the foodie—particularly disgusting in all that he/she glorifies about modern culinary trends. Among the trends, Pearlman talks about how the lack of preparation is now valued in modern cuisine. Cooking used to be this skilled process of exacting techniques and refinement, she said; nowadays, chefs slice a tomato, sprinkle some herbs, and call it a salad. (But foodies love it, so long as they know it came from an organic farm no more than 50 km away). According to Pearlman, foodies only care about where ingredients come from or how an animal was pampered before it was killed, and it has changed the way chefs approach food. (So much for technique!) She calls their feigned interest in fusion cuisine “a badge of urban-elite status,” and a way for foodies—as Anderson put it—to hijack cultural differences in order to soothe their own anxieties about social change. It’s the new comfort food. A bit harsh if you ask me, but then again, most would probably call me biased. Every culinary book deserves a fair shake, so I’ll breeze through it once I get a chance. This industry is no stranger to scathing critiques. The problem, however, is that people have started to lump all food enthusiasts into one category of backwards tastes and entitlement. Well I’m here to coax all the food lovers out from under the bed and tell you it’s okay. It’s okay to count down the days till the next restaurant opening. It’s okay to be curious where a restaurant gets its arugula. It’s okay to pretend you’re an NYT food critic when you’re reviewing restaurants for your friends (because if your parents hadn’t pushed you towards accounting, we all know you would have made a good one). It’s okay to slice an heirloom tomato, adorn it with nothing but a hint of salt, and call it the best thing you ever ate. Because hey, what’s better than a fresh tomato in the summertime? I’m here to defend the foodies—those inspired, excited and inquisitive about food—and detach it from a social stigma. Because if there’s one thing this New Orleans girl knows, it’s how to love food. My mama, granny and many other New Orleans greats taught me that long ago. So I say this with conviction: there’s nothing wrong with a little food lovin’. This entry was posted on May 22, 2013 by Simone in SIMONE SEZ and tagged B.R. Myers, BR Myers, foodie, foodies, L.V. Anderson, LV Anderson, Smart Casual.